Cannot have non-objective player card attachments or take non-combat damage. While Ungoliant's Spawn is in the staging area, characters cannot be readied by player card effects. Forced: After you engage Ungoliant's Brood, your cards cannot ready for the remainder of the round. Shadow: If this attack is undefended, exhaust all characters you control. When Revealed: Each character currently committed to a quest gets -1 Willpower until the end of the phase. When Revealed: Until the end of the phase, each character currently committed to the quest gets -2 Willpower and is discarded if its Willpower is 0. When Revealed: Each player must search the encounter deck and discard pile for 1 Spider card of his choice, and add it to the staging area. The players must find and defeat Ungoliant's Spawn to win this game. Players cannot defeat this stage while Ungoliant's Spawn is in play. If players defeat this stage, they have won the game. You are playing Nightmare mode. 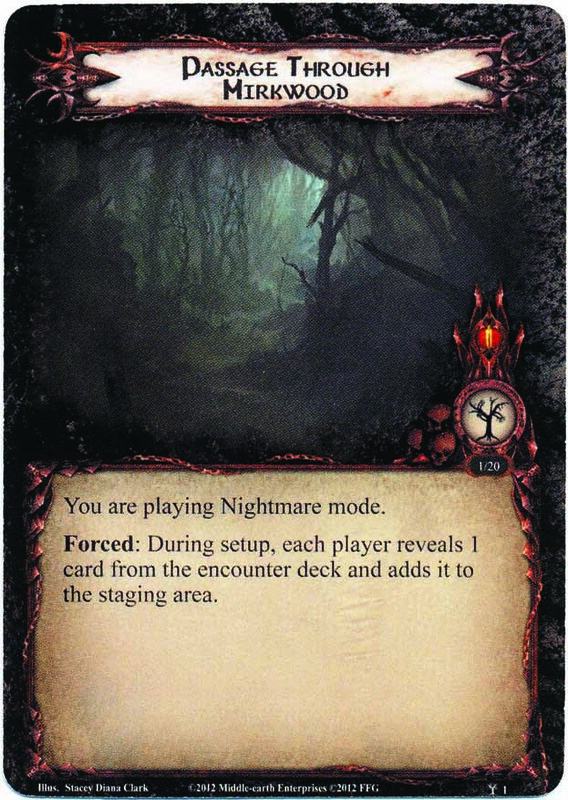 Forced: During setup, each player reveals 1 card from the encounter deck and adds it to the staging area. Begin with the standard quest deck and encounter deck for the Passage Through Mirkwood scenario found in the LOTR LCG core set. 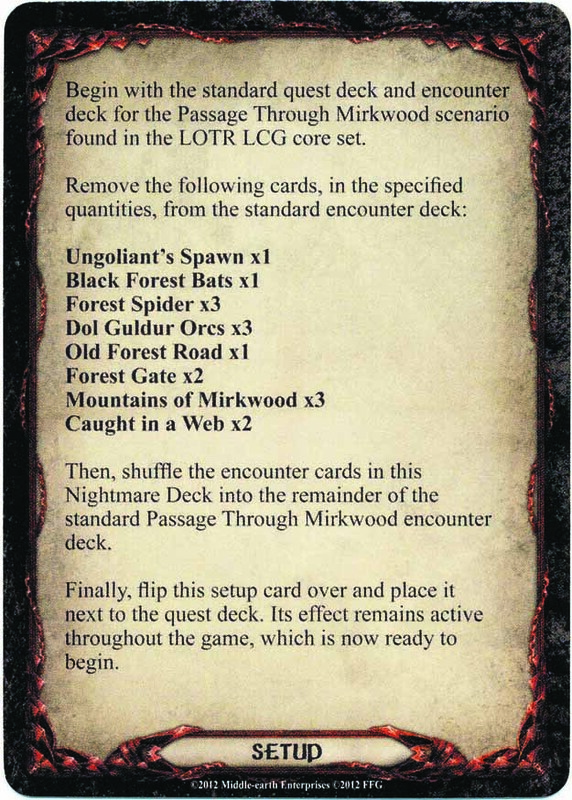 Remove the following cards, in the specified quantities, from the standard encounter deck: Ungoliant's Spawn x1 Black Forest Bats x1 Forest Spider x3 Dol Guldur Orcs x3 Old Forest Road x1 Forest Gate x2 Mountains of Mirkwood x3 Caught in a Web x2 Then, shuffle the encounter cards in this Nightmare Deck into the remainder of the standard Passage Through Mirkwood encounter deck. Finally, flip this setup card over and place it next to the quest deck. Its effect remains active throughout the game, which is now ready to begin.